Today is Bhai Beej, bhai dooj or bhav bij and none of my brothers are near. Its a festival like Raksha Bandhan, a day dedicated to the love between brothers and sisters. Normally on this day brothers are invited by the sisters for a hearty meal. A tilak and arti is performed and in return the sisters get a gift. The spirit of love and togetherness is celebrated on this day. For this special occasion, I had planned on trying out a new recipe from Tarla Dalal’s numerous mithai dishes but my injured toe does not allow me to stand for too long. 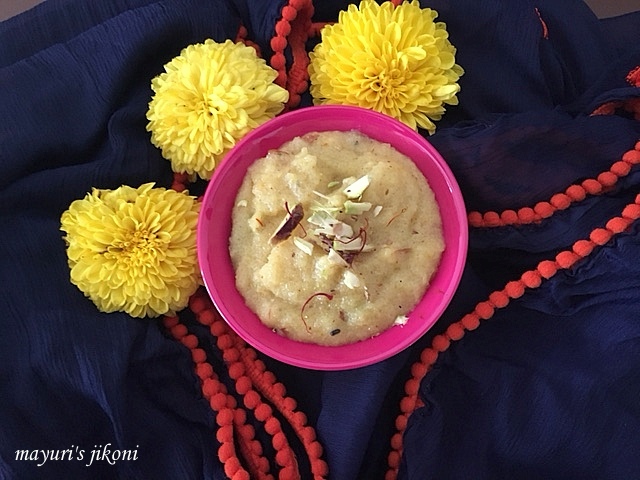 I made shiro or what the rest of India calls sooji halwa. Easy,quick and a bit friendly on my injured foot. Talking about shiro, I have to mention that the best shiro I’ve ever had is when there is a Satya Narayan Katha, somehow the shiro just tastes different and at the Sikh temple in Makindu, Kenya. It has been years since I last went there, but I remember we use to get nice buttery warm shiro as prasad whenever we visited the Gurdwara. The shiro was made with salted butter and not ghee. Heat ghee in a pan over low heat. Add the semolina and roast it in the ghee till it turns pinkish in colour. Stir it constantly to avoid the semolina from getting burnt. This takes about 10 minutes over low heat. Add warm milk,raisins, chopped almonds and sugar. Be careful when you add the milk as it will splatter and hot steam will come out. Stir gently till it becomes like a soft paste and comes away from the sides of the pan. Add cardamom powder and saffron and mix well. Garnish with the pistachio and almond flakes and serve piping hot. I prefer to use slightly coarse semolina for this recipe to give a more grainy texture. If you cook the shiro ahead and it becomes slightly hard, add a bit of milk when you heat it up. Add or omit raisins according to your preference. I love to have a bit more in mine. I find ¾ cup sugar just right. Add 1 cup if you like sweeter shiro.